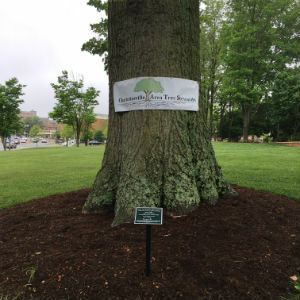 Today is Arbor Day and to celebrate, the Charlottesville Area Tree Stewards presented a small plaque of recognition for the large Pin Oak on the front lawn of the Albemarle County Office Building on McIntire Road in Charlottesville. Dan Fowley (certified Arborist and member of the Tree Stewards) was present to receive the plaque on behalf of the County. Every Arbor Day the Tree Stewards designate a “Landmark Tree.” Last year, a similar plaque was presented for the American Elm at the County courthouse. Trees absorb pollutants like ozone, nitrogen dioxide, and sulfur dioxide through their leaves; they intercept storm water runoff by holding water on their leaves, bark, and roots; and they provide food and nesting areas for squirrels and birds. The Pin Oak that was recognized today has an estimated height of approximately 140 ft. Its circumference is over 16 ft. and it measures 61 inches in diameter at breast height (DBH). A tree with a 45 inch DBH measurement will remove over 1,400 pounds of carbon per year. An average mid-size sedan traveling 12,000 miles per year will generate approximately 11,000 pounds of carbon per year!